As a birder, there are some spots you never forget—places where good fortune prevailed and you found something special. I could show you the exact tree, for example, where I saw my first yellow-billed cuckoo, a bird I’d been hoping to see for years. It was at Churchill Woods Forest Preserve in Glen Ellyn. I’ve been visiting Churchill more often lately, not for the “cuckoo tree” but to check on some other trees containing giant nests made of sticks. If you’ve never seen great blue heron “rookery,” now is a fine opportunity. A small nesting colony of great blues is easily visible from the parking lot just off Crescent Boulevard, the south entrance to Churchill Woods. Look across the DuPage River to the small islands and you’ll see five active nests. Four of them are clustered near the top of a tall dead tree. Great blue herons are large, long-legged waders. They are usually seen alone, feeding along the edges of ponds and streams. So it’s almost a shock to see the birds congregating up in trees. Herons are believed to nest in colonies primarily to protect their eggs and young from predators such as raccoons. The Churchill rookery is fairly new, according to Scott Meister, animal ecologist for the DuPage County Forest Preserve District. He told me the first nest was noticed in 2003, two appeared in 2004, and a third in 2005. So the colony is growing—a positive sign for the preserve’s ecosystem. Visit the rookery in May and some fuzzy-headed hatchlings should be in the nests. But that’s just one reason to go birding at Churchill. The 270-acre preserve offers great habitat diversity, including mature forest, wetland, savanna and prairie. This attracts many kinds of birds. Colorful warblers, orioles and tanagers will arrive on the scene this month. 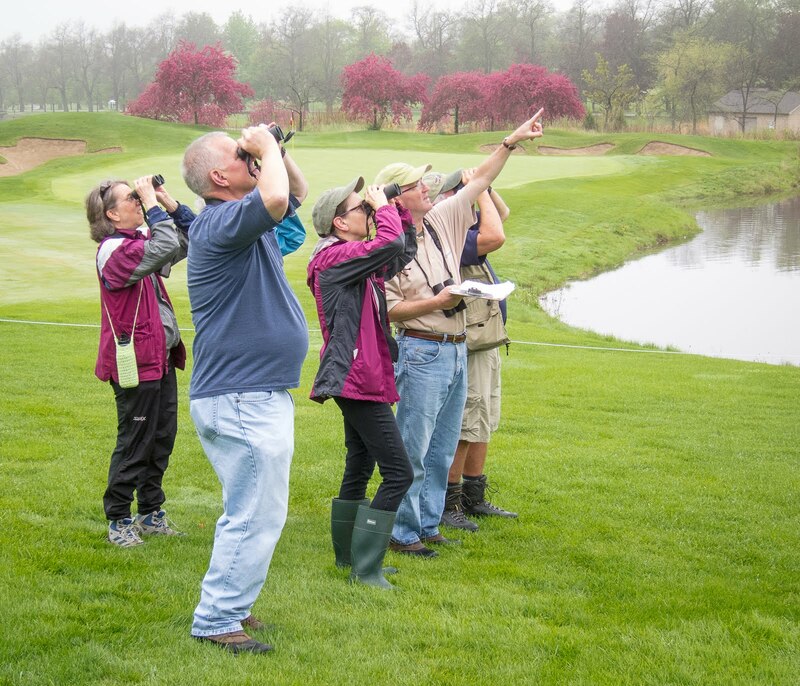 Glen Ellyn resident Jim Hedges spent all of 2005 monitoring bird populations at Churchill for the Forest Preserve District. In 88 total hours of observation, he recorded 103 species. One of his most surprising finds, he told me, was nesting red-headed woodpeckers. They are not at all common in DuPage County, and Churchill Woods is one of the few places I’ve seen them myself in this area. Other “goodies” Jim observed last year at Churchill were alder flycatcher and nesting chestnut-sided warblers. He finds the most consistent bird activity to be along the north side of the river from the youth campground west and north to St. Charles Road. You can park at the main entrance to the preserve off St. Charles and pick up a map at the trailhead. Also in April, I twice found a singing Carolina wren in the woods adjacent to the parking lot that overlooks the rookery—a very nice bonus. Churchill Woods is a place worth exploring. For more information, go to www.dupageforest.com, or call (630) 933-7200.